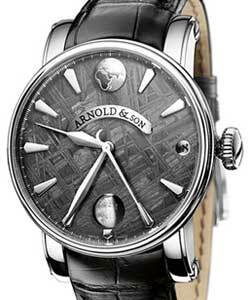 In 1764, John Arnold, son of a clockmaker. 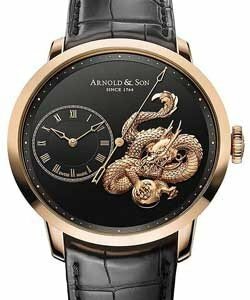 set up his workshop in the Strand, London. 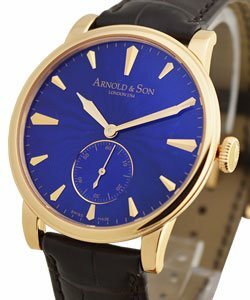 After creating a minute repeater-ring for King George III, John Arnold and his watches started doing the round of London's wealthiest. 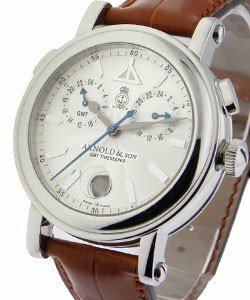 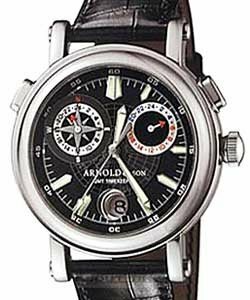 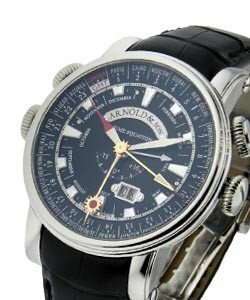 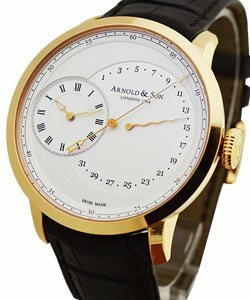 In the 1770's; Arnold's son Roger joined him in his watchmaking business, and they started concentration on the creation of beautiful and accurate Chronometer watches. 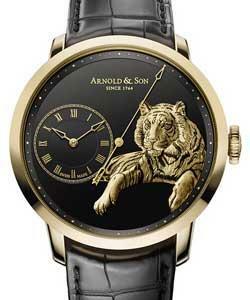 Arnold & Son watches soon became the leading supplier to the Royal Navy, and their chronometers also accompanying famous British explorers: Cook, Phipps, Vancouver, Flinders, Dr. Livingstone, John Franklin, Sir Ernest Shackleton, etc. 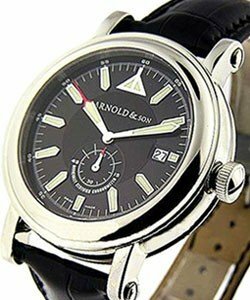 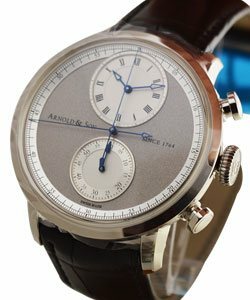 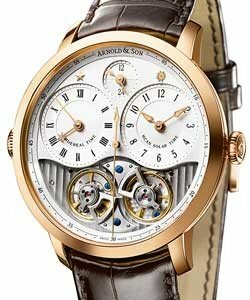 Arnold & Son watches are classic, beautifully engineered and continue to be seen on the wrists of the wealthy. 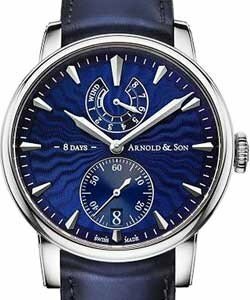 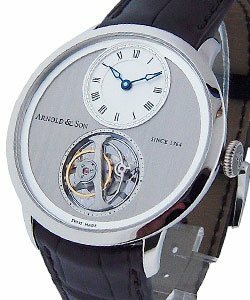 Arnold and Son Watches are well known for their tradition of excellence in complicated watches, thus their lines are separated into two lines; 'Mid Complications' and 'Grand Complications'. 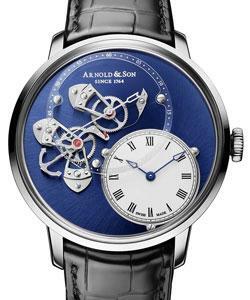 'Mid Complications' features the 'Arnold & Son HMS1', 'Arnold & Son True Moon', the 'Hornet James Cook' and the 'Arnold & Son Hornet'. 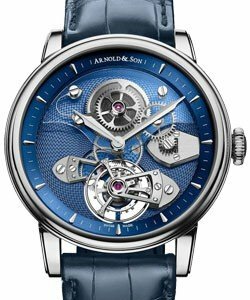 With a 40mm case, a skeleton back and a small seconds hand at 6 o'clock, Arnold & Son's 'HMS1' is the perfect classic timepiece with the modern twist of its large 40mm case. 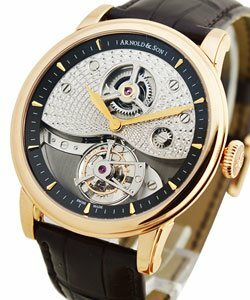 Available with a white dial in both Steel and Rose Gold, and with a black dial in Rose Gold, 'HMS1' is the watch for the modern man who likes classic style and clean lines. 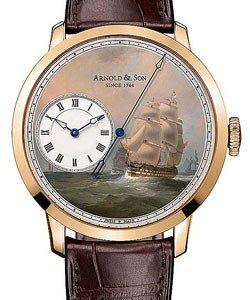 Commemorating the discoveries of famous English explorer, Captain James Cook, Arnold & Son's 'Hornet James Cook Limited Collection' features scenes from three of Cook's voyages; 'The Landing at Botany Bay in Australia', 'The Discovery of Antarctica' and 'The Death in Hawai'. 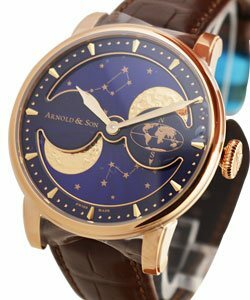 Housed in extra large 47mm Rose Gold cases, all three timepieces are World-time, with their Worldtimer outer ring rotation adjustment at 9 o'clock, the time zone pushpiece at 2 o'clock, and the second time zone adjustment at 10 o'clock. 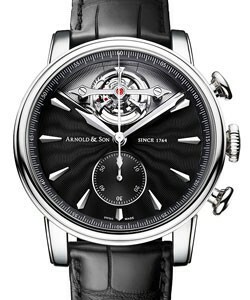 Featuring exclusive Arnold & Son calibre A1766 with four central hands, hour triangle red-tipped hands and a long minute hand, 'Hornet James Cook' watches' first time zone is shown by a long triangle-tipped hand with white superluminova completing a full turn of the dial in 24 hours. 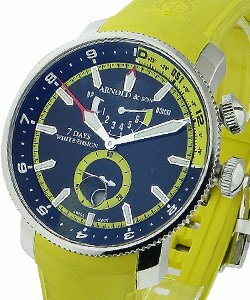 The second timezone.is shown by a long sun-tipped hand with white superluminova. 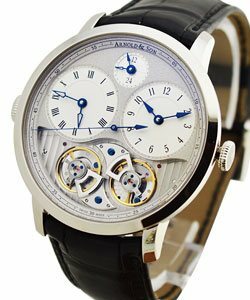 Artistic, historic, and incredibly bold, this collection is extremely limited with just 25 sets of the three watches released. 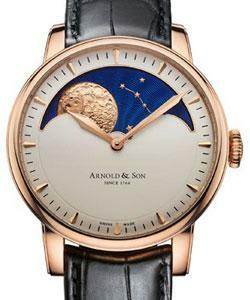 Available in either Rose Gold or Stainless Steel, Arnold & Son's 'Mid Complications True Moon' watches are 46mm, feature an incredible patented moonphase system, and are secured with a large scale alligator strap. 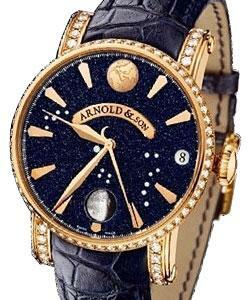 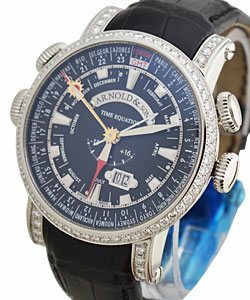 Two extra special dials are available with 'True Moon'; the blue dial is set with 19 diamonds stars depicting the Big Dipper, Small Dipper and Cassiopeia, while the dark gray is made of precious meteorite stone so rare that it represents only 14% of all meteorite stone found on earth. 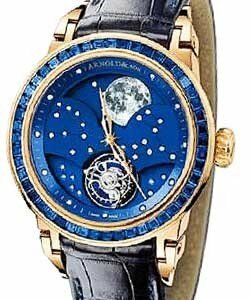 Both technically flawless and aesthetically stunning, 'True Moon' models are the epitome of cosmic refinement. 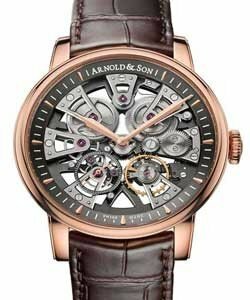 Also part of the 'Mid Complications' line, Arnold & Son's 'Hornet Worldtimer' is an exquisite black dialed World-time watch available in an extra large 47mm Rose Gold or Stainless Steel case. 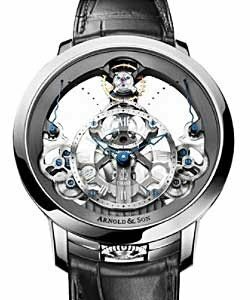 Featuring a rotating GMT bezel ring with World time-zones and cities indicator, four crowns and push pins at 9, 10, 2 and 3 o'clock, the double disc date at 5 o'clock, and a centered circular month, the 'Hornet' is a technical masterpiece. 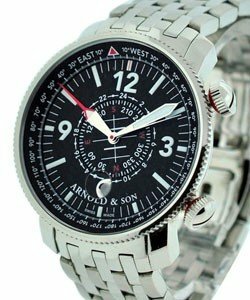 Watch hands can be set to indicate two of twenty-four different time-zones marked on the outer ring, additionally, for time zones like those of India and the Pacific the Golden sun-tipped hand can be set on half time-zones. 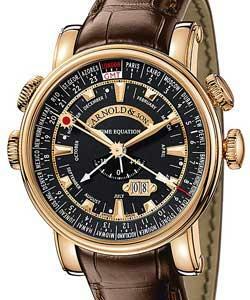 As this Golden hand is 'sliding', it can also be set to display the mean solar time of any location. 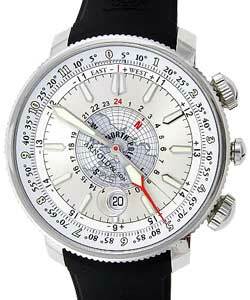 Informing the wearer of the difference between true solar time and mean solar time, there's also the triangular equation of time. 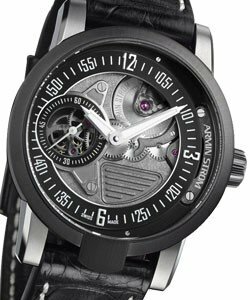 Complicated and incredibly handsome, the 'Hornet' is definitely one to consider for any stylish man seeking a World time watch. 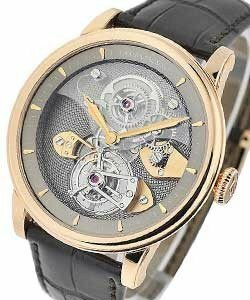 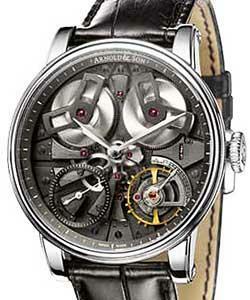 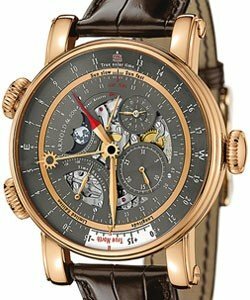 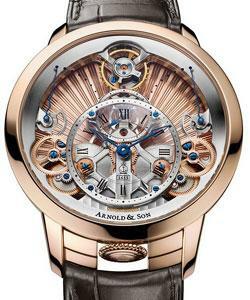 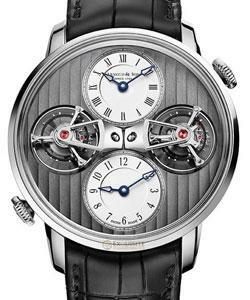 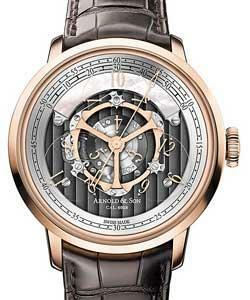 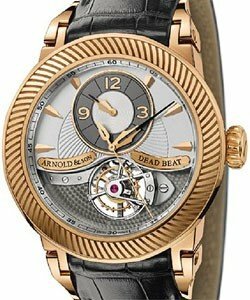 Arnold & Son 'Grand Complications' features the 'TE8 Tourbillon', the 'Dead beat', and the 'Sir John'.